After a poor performance in 2017, Singapore’s construction sector output continued to shrink in 2018, due to subdued activity in private and public building projects and a large supply of already completed private housing projects and offices. The postponement of the Kuala Lumpur-Singapore High-Speed Rail (HSR) project will impact engineering and construction firms in 2019. In summer 2018 the government introduced higher fees and rates, and tighter loan limits to cool down the property market. The measures were a reaction to a sharp rise in private residential prices, triggered by a large number of en bloc sales since Q3 of 2017. This is likely to dampen activity in the private residential market in 2019. 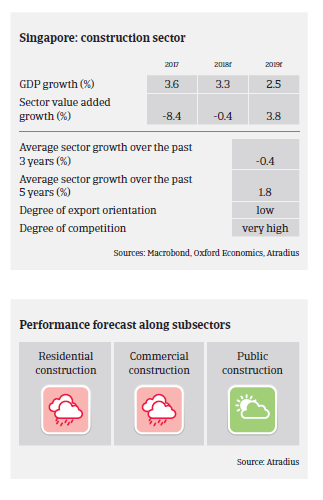 The profitability of many construction businesses is low and profit margins are expected to deteriorate further in 2019. SME contractors in particular, continue to suffer from tight cash flow and deteriorating margins. This is due to a lack of projects, increasing competition, and higher labour and rental costs. Singapore´s construction businesses are heavily reliant on banks for loans and project funding. Government measures to cool down the property market include tighter lending criteria (such as higher deposit requirements, lower loan-to-value limits, additional stamp duty and higher interest rates) for both private consumers and developers. Payment duration in the industry is 60-120 days, on average. Payment behaviour slowly deteriorated in 2017 and 2018, and this negative trend is expected to continue in 2019. According to the Singapore Commercial Credit Bureau (SCCB), the construction sector recorded the highest percentage of delayed bill payments for the ninth consecutive quarter in 2018. The protracted default rate in the industry remains high. Business insolvencies increased in 2018, and are expected to rise further in 2019. Construction businesses can now choose adjudication under the recently updated Building and Construction Industry Security Payment Act (with an emphasis on debtor protection and corporate rescue), rather than resorting to litigation or arbitration. While this offers valuable breathing space and a chance of survival for struggling SMEs, slow payments continue to trouble businesses. Due to sluggish demand, tough competition, tight margins, slow payments and increased insolvencies our underwriting stance is restrictive for the residential construction, commercial construction and the construction materials segments, especially for smaller contractors. That said, we are generally open for businesses active in the public construction segment, as government investment in infrastructure projects and civil engineering works remains high (expected to amount to between SGD 26 billion and SGD 33 billion annually in 2019 and 2020 respectively).